Samsung Electronics will officially sponsor the Olympics until 2028. As such, it has extended its original contract by eight years from 2020. On Tuesday, Samsung Electronics signed a contract with the International Olympic Committee (IOC) to extend its official sponsorship contract to the 2028 Summer Olympics Games in Los Angeles. 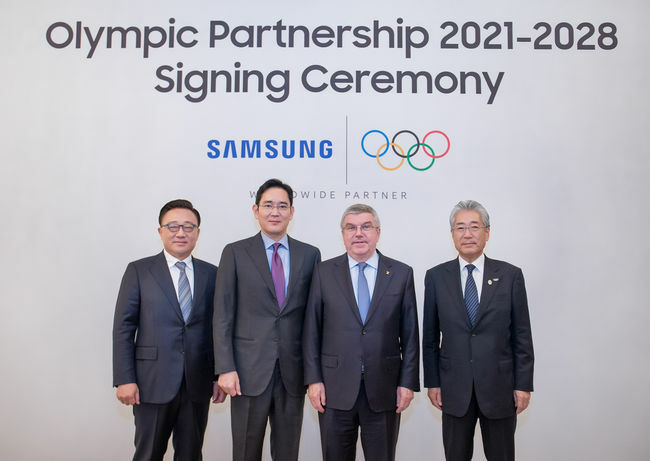 The president of Samsung Electronics Koh Dong-jin, along with the company’s vice chairman Lee Jae-yong signed the contract with Tsunekazu Takeda, chairman of the IOC Marketing Committee, and IOC president Thoman Bach present. Under the sponsorship contract, Samsung Electronics will participate in the wireless and computing field until the 2026 Winter Olympics and the 2028 Los Angeles Olympics, following the 2022 Beijing and 2024 Paris Olympics. The venue for the 2026 Winter Olympics is still undecided. Through this sponsorship contract, Samsung Electronics has secured rights not only for wireless and computer products, but also for 5G, AR (Artificial Reality), AI (Artificial Intelligence), and VR (Virtual Reality) technologies that operate on products.